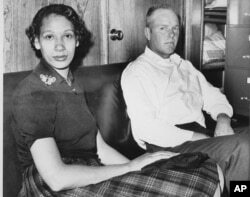 The US Supreme Court case Loving v. Virginia struck down bans on marriage between people of different races. This case goes all the way back to the 1691. At that time, the colony of Virginia said people of different races could not get married. Restrictions against interracial marriage remained in effect well into the 20th century. The restrictions did not prevent two Virginians, named Richard and Mildred, from falling in love. Richard’s family was white. Mildred’s was a mix. In 1958, Richard and Mildred went to Washington, D.C. Interracial marriage was legal there, and the couple wed. Then, they returned to the small town in Virginia where they lived. Five weeks later, police came into their house in the middle of the night and took them to jail. Richard and Mildred were ordered to leave Virginia. The couple settled in Washington, D.C., and had three children. But they missed their friends, family and home. So they took their case to the Supreme Court. The justices all agreed. They struck down laws banning interracial marriage, saying the U.S. Constitution permitted individuals, not the state, to decide whom to marry. By the way, the couple’s last name? Loving. The case is known as Loving versus Virginia.